T. Alex Blum and Andrea B. Ruskin of Blum Consulting Partners are experts when it comes to optimizing creative operations processes. We caught up with them ahead of their session at Creative Ops San Diego to learn more about their experiences and advice. 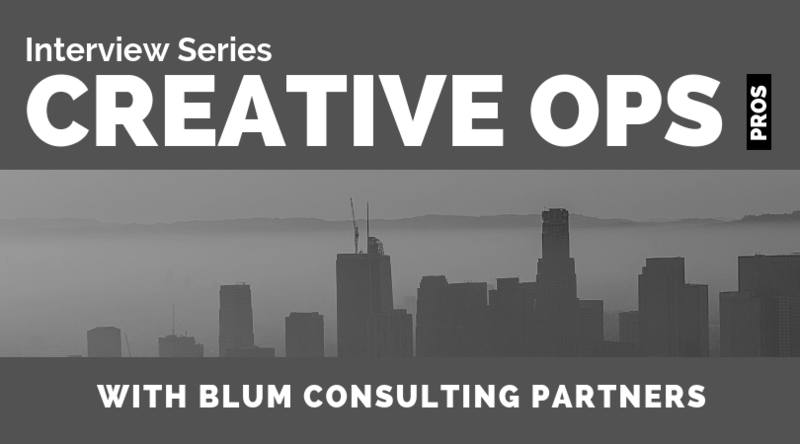 What does Creative Operations mean to Blum Consulting Partners? It’s really at the core of what we do. As a consultancy, our core belief is that better process drives better creative, so we see Creative Operations as the infrastructure that supports that. We believe it’s possible for an organization to function effectively and produce good work while still allowing creative people to avoid burnout by actually having a life outside work, and an efficient, smooth-running, creative operations organization makes that possible. How did you both get into this space? We both had experience as consultants working with Fortune 500 clients advising them on production. It became apparent to us that the role that we were most interested in was working on enterprise-level process analysis and innovation projects, so it was a natural evolution for us to build our business around that. At the same time, the growth of in-house agencies and direct sourcing at brands was fortuitous for us because it dovetailed perfectly with our business model. How has your time as production company owners helped you on this journey? Running a production company is all about managing the creative process and balancing the needs and agendas of all the players in the process. This ranges from directors, to agency creatives, to brand clients, and putting the tools in place to produce a high-quality result within a highly compressed time-frame with a lot of stress and pressure in the mix. If you can master that environment and be successful, it gives you a unique perspective on any other execution process. Nothing scares you. You're running a workshop at Creative Operations San Diego on optimizing processes – why is this so important? The Creative Operations Conference is the perfect forum to collaborate with smart people who are solving problems every day to deliver the best creative they can that meet their business objectives. It’s important for people who are in the thick of things trying to execute and get the job done, to know that the challenges that they are dealing with are common challenges that others are facing or have faced before and solved. Common experience really helps people feel confident about reaching their goals and understand that the issues they are dealing with may be common to the process as opposed to their particular organization. Also, it’s always entertaining to hear other people’s war stories. Is there a specific problem you see lots of agencies (in-house and out) struggling with? Keeping up with the rate of change in the industry and distinguishing between real trends that are driving the industry, and hype. Just look at the number of companies selling martech tools in the industry now versus ten years ago. Try to focus on the goals of your organization and the things that can actually help you reach those goals and don’t waste time reacting to every new piece of technology or information that appears on the scene. Economic Darwinism will take care of most of them and the ones that are left will be the ones that mattered in the first place. What key piece of advice do you give to your clients that want to take their production to the next level? Be clear about your goals first, and make sure you have the right tools for the job. Everyone always wants to talk about what they’re going to do before they are finished figuring out why. Make sure you have a defined process for every step of production from creative briefing through delivery and project post-mortem. Where do you see Creative Operations headed as a discipline? Any predictions for the future? Marketing organizations have to be efficient, and they have to produce more and more creative assets under constant unrelenting price pressure. And it’s not going to change any time soon, so creative operations can only become more important as the driver of that efficiency and speed. Anything that provides that kind of value in a market like this can only become more and more essential.